Adrien Berlioz of Domaine du Cellier des Cray and Frédéric Giachino of Domaine Giachino. It's possible to turn up the occasional vin de Savoie in the more forward-thinking restaurants and wine shops in the states, where somms and wine geeks are often looking for the next keen blistering white to ratchet up the acid. (Hence the relative geek cache of Vermentino, Pecorino, Aligoté, etc.) Whereas in my experience, rich Savoyard reds, based primarily on the Mondeuse grape, remain on a whole other level of obscurity. In a region known for bracing, aerial whites, it's surprising to encounter these tannic little mini-Sagrantino's*** from the Mondeuse grape. 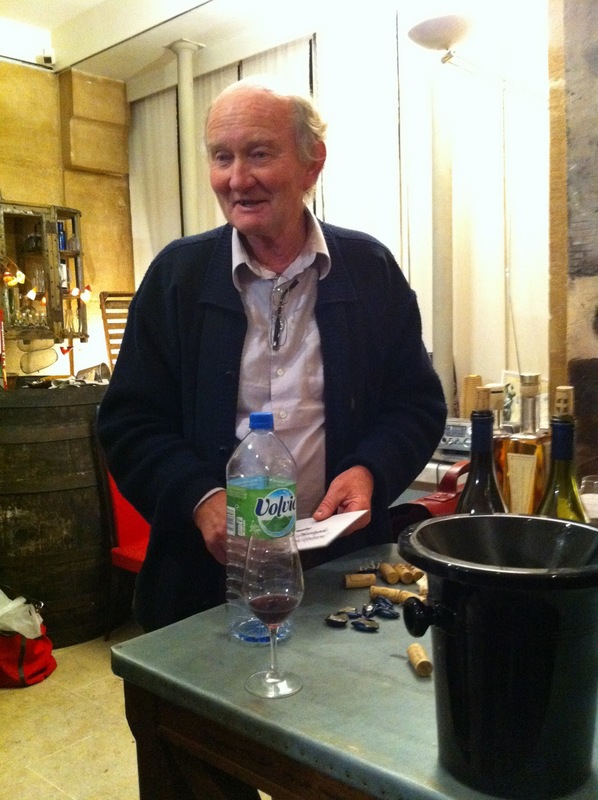 Adrien Berlioz of Domaine du Celliers des Cray is pictured above wielding his 2009 "Cuvée Marie-Clothilde" bottling, from 55 year old vines. It was probably the most polished, ready-for-prime-time Mondeuse I tasted that day: ripe, jet-black tannins, sinuous on the palate, with a just-perceptible violet component, like a Prince song overheard from an adjacent apartment. 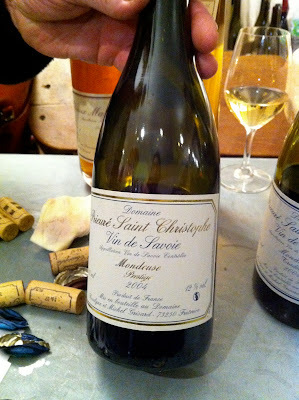 Winemaker Michel Grisard, of the organic estate Domaine Prieuré Saint Christophe, presented a markedly less modern 2004 Mondeuse "Prestige" that foregrounded the music a little more. At 6 years' age, this was the oldest Mondeuse I tasted that night, but still rather young for this wine. (I've read others' tasting notes online on the "Prestige" reporting great bottles dating to the mid-eighties, which, if the notes can be relied upon, is a fairly impressive feat.) Ordinarily with fist-tight reds like selection-level Mondeuses I wonder whether the initial hardness will ever yield to complexity; in this instance the wine was already providing some good reassurances of tea and dark cherry amid all the tannins. 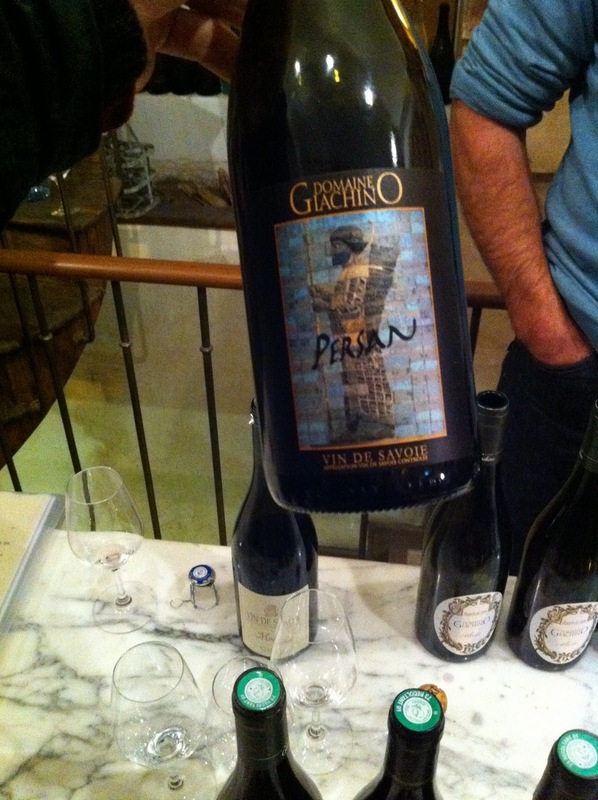 The final surprise of the evening was another grape that had heretofore been unknown to me - Persan. Google searches for it yield a lot of Iranian cultural information. From what I gather it's a bit of a Savoie rarity; in George Kerridge & AJ Antcliff's Wine Grape Varieties, Persan is mentioned only once, as an eastern French varietal previously used to provide body and color to blends that incorporated another forgotten grape, Peloursin. So it's kind of the Petit Verdot of Savoie. I tasted two that evening and preferred the one pictured above, a 2009 Persan by the genial Frédéric Giachino of Domaine Giachino. *There's the whole "uncritical / insatiable local demand" thing. And the whole "teensy production" thing. **Yes, that is kind of a coded way of saying that I personally don't find them particularly pleasant. It doesn't stop me from judging these wines against each other, or admiring the craft that goes into them. I'm just a total girl when it comes to heavy reds. ***A central-Italian red grape grown in Umbria known for its astonishing tannicity.